We offer full dog grooming. All your needs and for all breeds! For walk in customers – Paws clipping only! 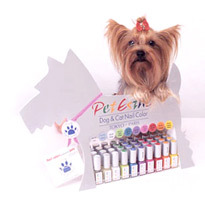 Also, we are providing Dog’s Nails Colouring service. To make sure you’ve got the latest prices, ask the receptionist next time you visit our salon. I would recommend all cat and dog lovers to come here, my cat Doreen had the works and since she had the luxury treatment she has been a lot more affectionate and happy I put this solely down to how well she was treated and just how much dedication and skill was gone in to grooming her! Her coat feels amazing its soft and healthy before it was quiet dry and she would groom herself continuously and make it matted especially around her mane area, her skin must feel a lot healthier to her too as she is grooming less and is a lot more content! Doreen suffers mucky ears and I found the upkeep can be quiet a struggle if you don’t know what your meant to do and worry your doing to hurt your cat the same as claws … All these things i would say leave to the experts at pet universe as your pet is in safe loving hands! You can tell that pet universe are passionate about what they do I had Edita groom Doreen and she was wonderful a very lovely lady who looked after Doreen! Definitely go here your cat or dog will love it and you will notice such a difference in there behaviour! I just wanted to say a huge thank you again for the wonderful job you did on Seville and Pluis! When I came home I could take a good look at them standing up and showing off their wonderful shaped cuts! They both look fabulous + this is definitely the best they have ever looked. Also, I think they are thrilled with it – even Pluis is cleaning himself a bit more! It was lovely to meet you and thank you for taking care of my kitties so well. Svetlana did an amazing job on my usually 2 very resistant cats. She came, she clipped and they were super happy. Amazing!!! Excellent service!